Grilled Fish is such a simple dish, but it can be so delicious! This recipe allows you to choose your favorite type of fish, from salmon, swordfish, halibut, tilapia or any other favorite. So heat up your indoor or outdoor grill, and start cooking! Chop all vegetables and herbs and combine in a small bowl. Add lime juice and stir together. Salt and pepper to taste. Heat an outdoor or indoor grill pan to medium heat. Pat salmon dry with paper towel. Salt and pepper salmon, then spray tops with cooking spray. 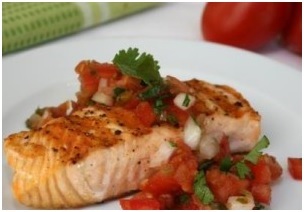 Place salmon on grill and cook for about 3 to 4 minutes per side until cooked through. Remove from grill, top with salsa and serve.